William of Mass Destruction: High Clouds And Misdemeanors. What? I've just been waiting for a decent sun puddle and minding my own business. I hope you get some sun. Working on your tan os a good idea..u]Um...what's down the hallway I wonder? That's a good spot, then. We hope you get everything you want. Patience is a hallmark of felinity. If the sun comes, it will be the purrfect spot! And... what are you really doing? Hope the sun finds you. I sure hope you don't have to wait too long! Oh Ivan, I think your momma has caught onto your tricks! I had a good street of sun puddles going. Today is not my day. Hope you get a puddle of your own soonest. 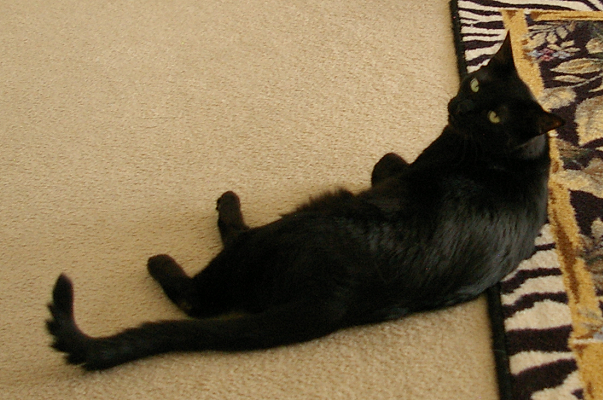 Long lean and handsome panther. Looks like a very good spot to wait for a sun puddle.